Though Micòl Ceramics makes a wide variety of home products, Micòl Hernandez is truly a sculptor at heart! Since earning her degree in Ceramic Sculpture from the School of Arts and Design in Valencia, she has continued to pursue her artistic vision with passion and diligence. In recent years, Micòl has focused on three main sculpture projects: “Faces,” a series of porcelain heads; “El Mar Fantastico,” a series of abstract sculptures evoking colorful undersea life with striking golden accents; and her “Seashells” collection of porcelain wall pieces. Below, please see photos and descriptions of these three sculpture projects and more. If you are interested in discussing an exhibit of Micòl’s work at your museum or gallery, please visit our contact page and get in touch for more information! 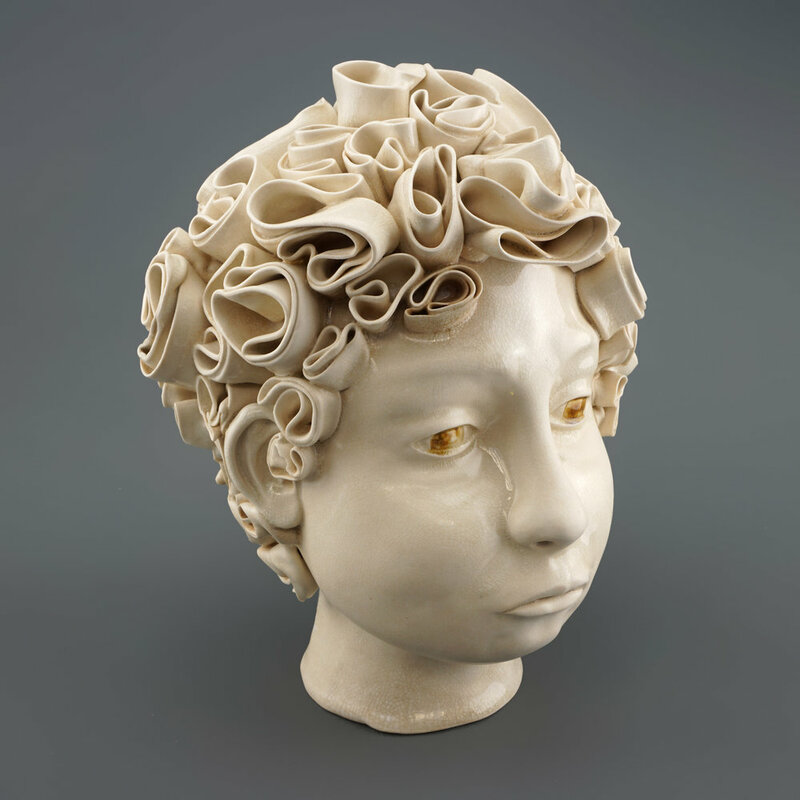 "Faces" is a series of porcelain sculptures Micòl began work on shortly after moving to NYC from Spain. Overwhelmed by the diversity of personalities, styles, ethnicities, and traditions existing side by side in every neighborhood, Micòl was moved to begin this series of faces, each exploring a different culture, style, or mood she encountered. “Faces” is an ongoing project. For information on potential exhibits, please visit our contact page. Please click on the images below for an enlarged, detailed view. Micòl spent her childhood by the Mediterranean Sea. She now lives in New York City, far from her birth home, and often has vivid dreams of her days on the beach with her family, swimming, playing games, collecting seashells. The bright colors, golden seashells, and sinuous forms of “El Mar Fantastico” are a dreamlike representation of Micòl’s love for the sea. 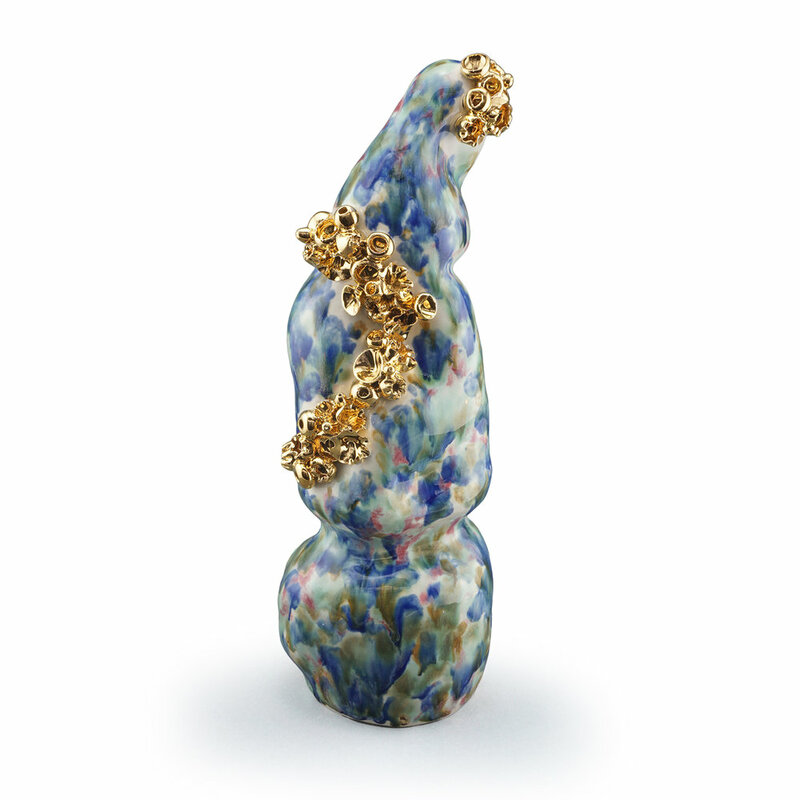 The “El Mar Fantastico” series is ongoing, and is made in fine porcelain with colored glazes and gold luster. For information on potential exhibits, please visit our contact page. These wall sculptures are inspired by Micòl’s childhood next to the Mediterranean Sea. Summers were spent on the beach, walking along the shore collecting all kinds of marine shells in a plastic bucket. Returning home, she would separate, clean, and organize them in glass jars. For these pieces, each tiny porcelain “shell” is hand-thrown on the pottery wheel. The natural instability that occurs as the wet porcelain spins around the wheel bestows each individual “shell” with a unique form and character. Micòl is constantly working on new pieces in the “Seashells” motif. For information on potential exhibits, please visit our contact page. These sculptural vases are inspired by the flamboyant, vividly-colored tails of the Betta fish. 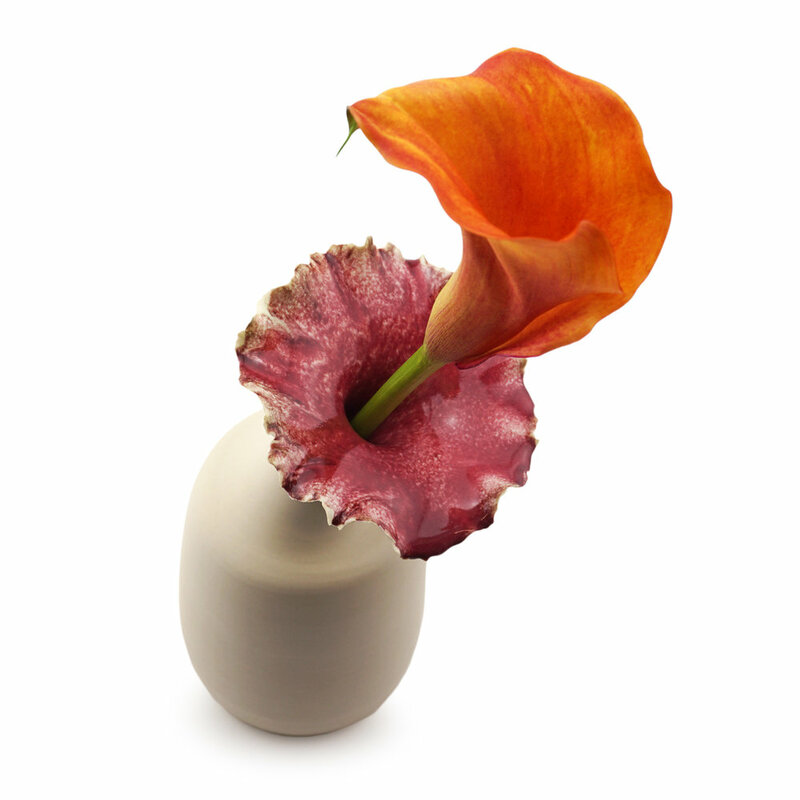 The vases’ evocative forms, with bold curves and slices, are also strikingly feminine. Micòl shapes these vases by hand on the potter’s wheel from fine porcelain. The sliced geometry and edges are then meticulously crafted with hand tools. Micòl is constantly working on new Betta vases. For information on potential exhibits, please visit our contact page.